Vim editor is a tool for creating, editing, merging and performing the operations, as you may used to do in the editors like Wordpad, Notepad, etc. The editor is used more by the programmers as they like to be with their keyboard only, not making much use of a mouse or a touchpad. Besides this, VIM editor has a feature of Autocomplete which is most liked by the developers. 2. Insert mode: You can enter into the insert mode by simply pressing “i”. This mode is used to insert the content into a file, you can navigate between the lines by the use of arrow keys. 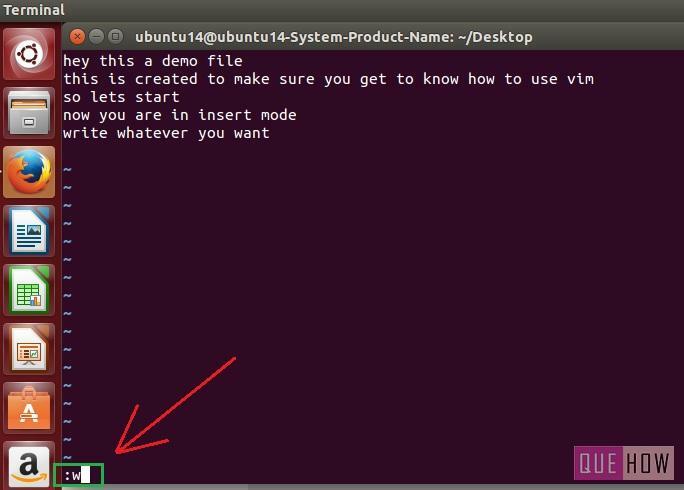 Step 1: To open a file in vim, firstly, go to the path where it is stored. My file is stored under home->Desktop and as I am already in home path, so I will go to the Desktop section. For this the directory has to be changed, so type the command “cd ~/Desktop”. I have entered “vim demo.txt” to open the file named as demo.txt. Step 3: Here you can see the content of the file. We are in Command mode so the operations which are stated earlier can be performed here. As you can see the cursor is at the letter “s” of the word “lets’, in order to go at the starting point of the line, you have to press “^”. Step 4: You can see in the figure below, that the cursor has come to the starting point of the line, this means that the above operation worked correctly. 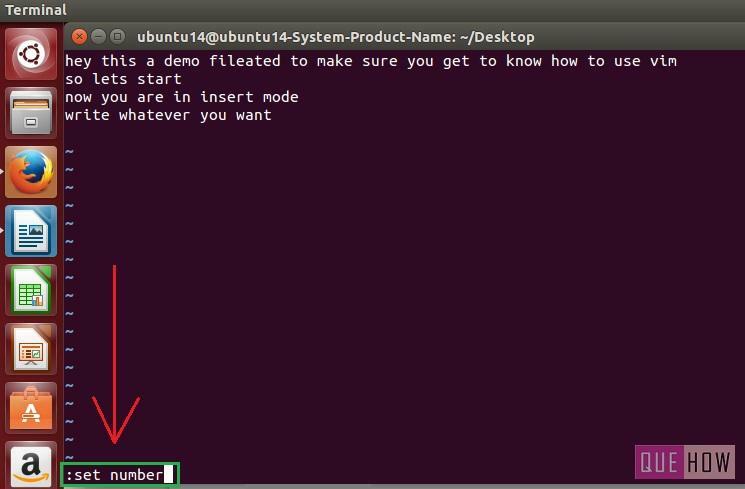 Step 5: Lets go to the start mode by using the “i” command. 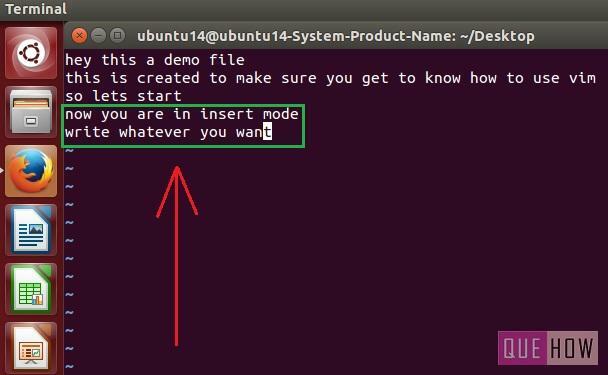 At the bottom of the terminal you will see “–INSERT–” that confirms, you have successfully entered into the insert mode. Step 6: Now you can append as much lines as you want in the respective file. I have typed in two lines as shown in the figure below. 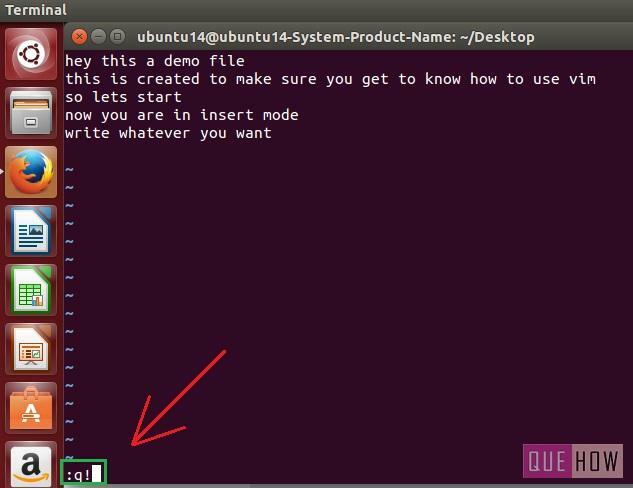 To save the changes you need to exit from the insert mode by clicking the “ESC” key. Step 7: Once you are finished with the editing, you have to enter into the Last line mode by pressing “:” i.e. colon. To save the file type “w” after colon i.e “:w”. 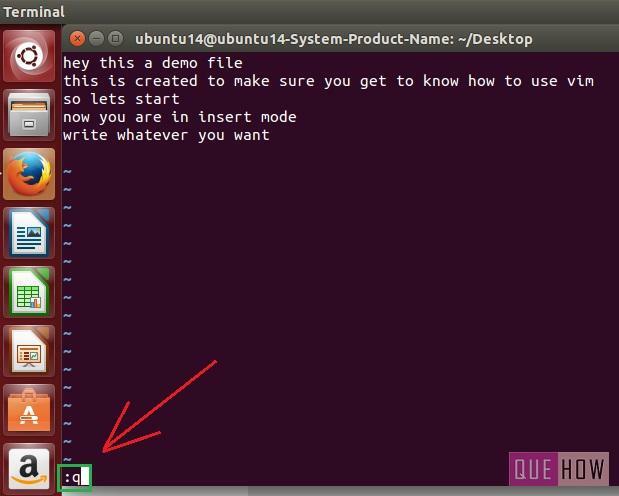 Step 8: To exit from the vim editor you have to press “:q” which means to quit. 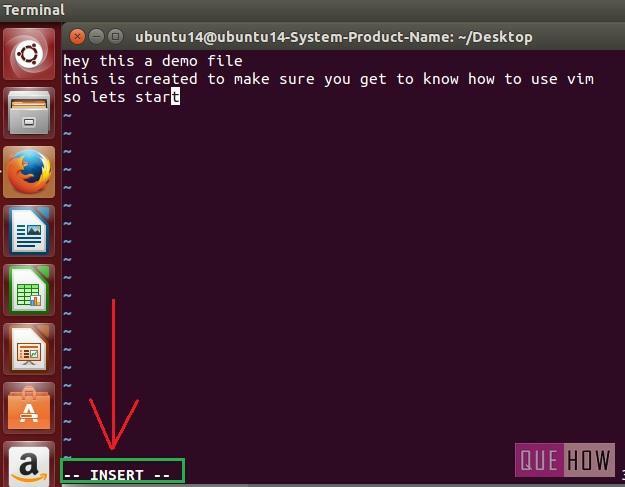 Step 9: If, due to any reason, you are not able to exit or want to close the editor without saving the last editing you’ve performed, then you can forcefully close the editor by using “:q!” command as shown in the figure below. Step 10: Some other last line mode commands such as “:set number” or “:set nu”, are used to enter numbers into the content that increases the readability of the content, as shown in the image below. Step 11: The content of the file demo.txt is arranged according to the number of lines present, as demonstrated in the figure. 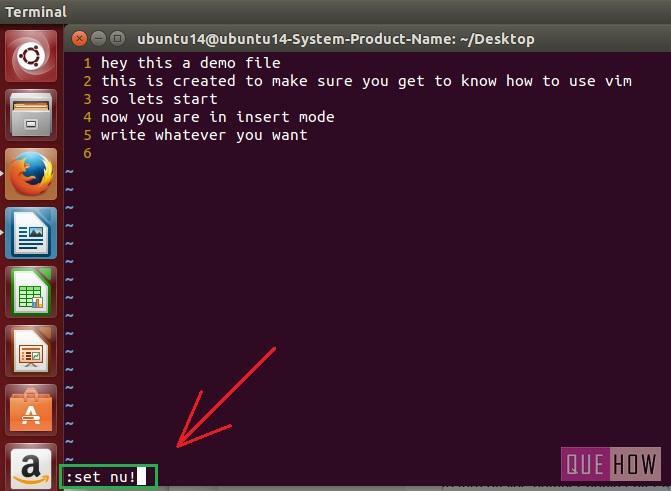 Step 12: If at, any point of time, you feel to undo the changes, then you can remove the numbers by just typing the “:set nu!” command.